After the Landragor event, we shall launch a brand new event, titled Ruler of the Planet. The preparation week begins on 23th of November. 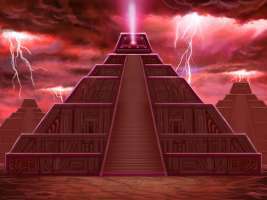 Although you do not have to register for the event, during this preparation time you can buy the Package of Dread once every day, which can be useful to survive the horrors of the Pyramid. The event itself launches on 30th of November, and lasts for 3 weeks, until 21th of December. So you will have time to gather your resources and get ready between 16th of Nov and 29th of Nov.
During the event, players have to complete the 7 levels of the pyramid. Each level will consists of 8 tasks. You have to complete all tasks on a given level to proceed to the next. Right at the beginning of the event, you will be able to see all tasks and rewards (not only those on the first level). Tasks will be the same for everyone. Each time you complete a level, you will immediately get a package of rewards (including ancient stones!). The first 2 levels can be completed even by a beginner player, but later levels will need experience (for level 3-5 of the pyramid, you will need to be at least level 25-30, for level 6-7, you need to be at least level 45-50). Still, we hope this event will be fun for even low-level players, because even completing the first 2 levels will be fun and challenge for them, and the rewards will be nice. On each level, you can skip up to 2 tasks, using royal decrees (ie. ancient stones or soul-energy) much like in the Temple of Doom. Be warned, though: the more royal decree you use, the more expensive will be the next! Players receive points for each task completed, and will be ranked on a top list by their points. If you have equal points, whoever reached that score first will be ranked higher. The top 15 player of the list will get additional rewards besides the pyramid level rewards. In addition to this, the winner will receive the title "Ruler of the Planet" for half year (displayed instead of the usual Pyramid of Glory rank). Since this is a race, can we get a more precise time of when it starts than 29th of November (i.e. the hour it starts)? And it sounds very good so far! What will the tasks be like? Similar to the Temple of Doom? What about rewards? Precise start time will be 14:00 pm CET (13 pm GMT, 8am EST). The majority of reward can be achieved regardless of your ranking, by finishing levels. Top ranking will just give some extra reward. Tasks will be like the ones in Temple of Doom, but of course not the same, there will be new surprises. There will be no tasks like "log in for 10 consequent days" or "use 5 manaconstructions" since those make impossible to race, everyone could do them at the same rate. Rewards will include ancient stones, a few new relics, consumable goodies and elements of a new game mechanism. This is really awesome, i can barely wait to see this. Nice, can't wait for new event! just for fun, whoever finishes in last place should be "Drooler of the planet"
From tomorrow, the Package of Dread will be available for purchase. Do you intend to disclose what this is for or should we should just buy it out of faith? So, anything happening with this event today? Looks like the "Package of Dread" has sold out already on W2. Didn't even see it in the soul huckster!!!! Where do we buy/ what catagory/ level is the Package of Dread? The preparation week begins on 22th of November. Although you do not have to register for the event, during this preparation time you can buy the Package of Dread once every day, which can be useful to survive the horrors of the Pyramid. The event itself launches on 29th of November, and lasts for 3 weeks, until 20th of December. So you will have time to gather your resources and get ready between 16th of Nov and 28th of Nov. So, the 22nd passed and nothing happened. No package of Dread anywhere to buy, no post on the forum about what is happening. Nothing. Is there even going to be an event? We are sorry for the delay! Originally we agreed that both the preparation and the event begins on the same day on every world. But our programmer changed the schedule, saying that he launches the event first on Thursday on the original worlds, and after everything is all right, he launches them 1 day later on the international worlds. I learned this today morning, and wrote the news accordingly. The Package of Dread is now available in the shop, and as the event's begin comes closer, we will add more information. So the official launch date is 30th of November, 14pm CET (8am EST). is it possible to complete temple of doom quests during this? I just started a new temple today but need to save my AP's for the event. The archgem is automatically used when you Hunt and find a "gigantic" animal. It gives you +25% SE (or +50% SE if you do not have DD). No idea if this is modified base SE or total SE, but I guess it is modified SE. Looks like Miklos editing of the first post broke the Image link. So the archgem is useless if you have DD? Also, maybe this is too difficult to implement, would it be more even if the "timer" started when the player started the challenge? I mean if two players complete the task in the same amount of time, but one started a couple hours earlier because they happen to be in one time zone vs. the other player being two hours or more behind that time zone, then the player in the earlier time zone wins if I am understanding this correctly. Edit: btw, 20 AS to protect 10 BOAS? Really? How many of those locked chest do the Soul Huskers plan to sell? Why would it be useless? If you have DD you get +25% SE, if you don't you get +50% SE. So this event will be similiar to ToD, does that mean we should save up APs or DPs or both? Should we have AS available for this event?